Faced with a growing list of problems caused by feral hogs, commissioners in Guadalupe County recently voted to institute a hog bounty. When the program officially begins, the county northeast of San Antonio will pay a $5 fee for all hog tails turned in at designated check stations. Home to an estimated hog population north of 2,000, Guadalupe County commissioners were besieged with the same issues as government officials and wildlife biologists all over Texas in recent years. They realized that business as usual wasn’t working and wanted to try something new. So, funded by a grant from the Texas A&M AgriLife Service as well as some matching funds from the county, the commissioners decided to implement this hog bounty on a trial basis with the option to expand the program in the future if it ends up working. Instituting a hog bounty makes sense at first glance. After all, if too few hunters and trappers are pursuing hogs, a bounty would ideally provide incentive for more people to get in the game and put more pressure on the hog population. If it works as intended, a bounty might actually turn out to be less expensive than hiring professional trappers. Unfortunately, it’s not always that simple, and bounties on their own don’t have a great record of success in dealing with invasive species like hogs. If the bounty is too small, it might not actually incentivize any more hunting or trapping. In that case, the county will just be paying people for activities they were already doing. On the other hand, a big enough bounty could also provide an incentive for people to engage in counterproductive behavior. For example, people could turn in hogs taken from other areas outside the specified bounty zone or, in extreme cases, specifically breed hogs to collect the payment. The Guadalupe County commissioners did implement some safeguards (like banning the importation or breeding of hogs to collect the bounty) in an attempt to mitigate these problems, but it remains to be seen how effective the program as a whole will be in achieving its goals. 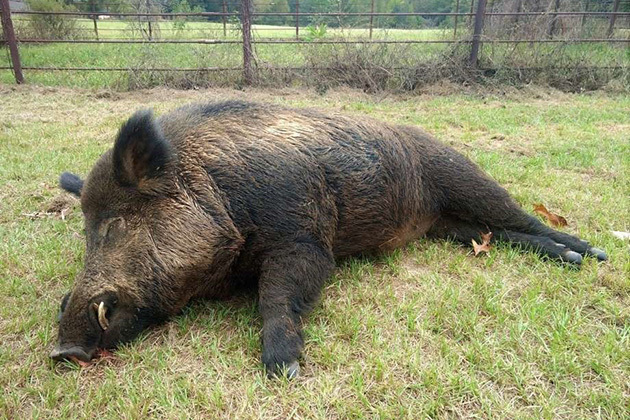 Over the past few years, officials in Bastrop, Caldwell, and Hays counties have implemented hog bounties for varying amounts of time. While hunters and trappers have indeed collected tens of thousands of dollars of bounties for hunting and trapping thousands of feral hogs, it’s unclear if those efforts had any lasting impact on Texas’ hog population. That’s not to say that bounties never work. After all, I recently suggested a market-based solution to the feral hog problem and a hog bounty could certainly fit within that framework to a certain degree. However, bounties tend to be most successful when implemented as part of a sustained and comprehensive strategy, not a limited duration program in a small geographic area. So, will the hog bounty in Guadalupe County have the desired results? Only time will tell. Unfortunately, the feral hog issue is a big problem and it will very likely require a big solution that goes well beyond a simple hog bounty. What do you think? Will the hog bounty in Guadalupe County have the results the county commissioners are hoping for?